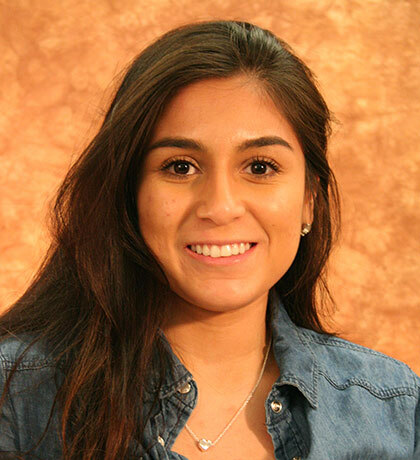 The whirlwind school year continues for Cowley College sophomore Stephanie Cabrera after the pre-pharmacy major was recently named the college’s Student of the Month. Cabrera is the daughter of Juanisela and Gregorio Cabrera. She is the granddaughter of Amalia and Alejandro Cabrera of El Salvador, and Antonio Rico and the late Juana Rico of Mexico. She has two brothers, Eric 16, and Christian 10. She also has a sister, Anamaryel 8. She attended Arkansas City High School where she was involved in numerous activities including soccer, tennis, band, color guard, SADD, KAYS, National Honor Society, and was a Soroptimist Girl her senior year. At Cowley, Cabrera served as a co-captain on the women’s soccer team, a Student Senate representative for Phi Theta Kappa, a Student Ambassador, and is involved in the IMPACT program. Cabrera was one of five finalists for Queen Alalah LXXXV and is a member of the Dean’s Honor Roll. She also took part in the PTK College project, Canvasing for a Cowley College campus in Sumner County. “I have been so busy, every week there is something different going on,” Cabrera said. Cabrera recently interviewed to be accepted to the University of Kansas Pharmacy School. Away from Cowley she has spent the past three years working at Walgreens pharmacy in Arkansas City. She also volunteers to assist with youth soccer camps and coaches a youth soccer team. Being named Student of the Month serves as reaffirmation for Cabrera to let her know she is doing a good job of managing her time. “My school work is always my top priority,” Cabrera said. With her time at Cowley winding down, Cabrera will be sad to leave the school.